Fresh summer ingredients from the farmer’s market in my kitchen and this is the result! Break up the roasted tomatoes right at the end and their goodness coats the spaghetti for a rustic no-sauce sauce. Just a bit of basil and salt season the dish to perfection! Preheat oven to 300. Coat the tomatoes with olive oil and salt, place them on a baking sheet, and roast for at least 40 minutes, they should look a little wrinkly! Slice the red onion into semi circles and saute in olive oil with a little salt until they are translucent. Cut the corn off the cobs and add it in with the onions. Saute until it is nice and golden in color. Gently chiffonade the basil and set aside. When the corn looks done, add in the tomatoes (oil and drippings from the baking sheet too.) Stir around breaking up the tomatoes with your tongs. This is good for two reasons (1) you won’t get the surprise bite of tomato shooting out very hot juice and (2) the roasted goodness from the inside coats the pasta for the perfect no-sauce sauce. Add in the basil (leave some out for garnish) and stir around. Drain the pasta and drop it into the sauce pan. 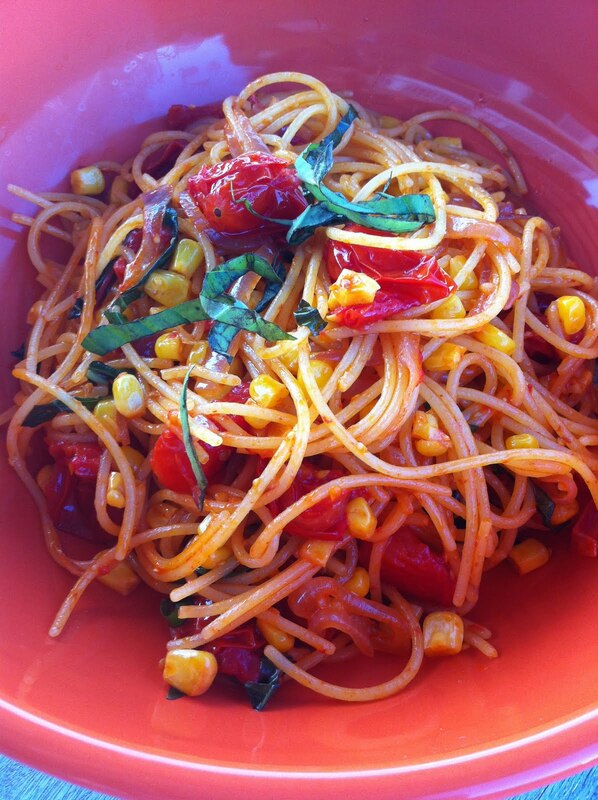 Mix it around to cover all of the spaghetti and voila: rustic no-sauce roasted tomato and corn pasta.